What do you want out of your marriage? Do you want to be connected as a couple? Gary Thomas explains that people get married to be accepted, but then pull back and hide from each other. But the best marriages are the ones where husband and wife say to each other "I am yours." Gary says you have to learn how to be open and transparent with each other if you want to deepen intimacy in your marriage. Recorded on FamilyLife's 2016 Love Like You Mean It® marriage cruise. Bob: For a marriage to really thrive, couples have to learn how to be transparent—how to be open and honest with one another. Here’s author Gary Thomas. This is FamilyLife Today for Tuesday, March 8th. Our host is the President of FamilyLife®, Dennis Rainey, and I'm Bob Lepine. We’ll hear from Gary Thomas today about things we can do to help deepen the intimacy in our marriage. Stay tuned. And welcome to FamilyLife Today. Thanks for joining us on the Tuesday edition. I don’t know if you’ve seen this ad on TV for the company that says: “Don’t settle for cable. Don’t be settlers.” Have you seen that commercial? Dennis: I think I have; yes. Bob: I’m just thinking there are a lot of couples who have become “settlers” when it comes to marriage rather than saying, “What is this supposed to be, and how can we have the best marriage there is?” They’ve just kind of settled in for mediocre. Dennis: They really have settled for second-best and not the best. I’ll tell you what, Bob—it is easy for a marriage to rob your relationship of its romance. Life has a way of dragging us down, getting us into the mundane—we don’t do it together / we don’t embrace life together as a couple. We’re going to be reminded today of how we can suffer with our spouse and love our spouse, perhaps, when they are suffering because people do bring things into marriage that they’re suffering about. Other things occur to them after you’re in marriage—it may be a child that doesn’t do well, it may be a health issue / an emotional issue. We’re called to truly love our spouse as Christ loved the church. Bob: And we’re going to hear Part Two today of a message that you and I had a chance to hear when we were together on the Love Like You Mean It® marriage cruise, back a couple of weeks ago. We joined 1,300 couples—took over a whole big cruise ship. Dennis: I mean, I met a couple there who had been separated for the past five years of their marriage. They restated their marriage vows and are going to celebrate 25 years of marriage this year because of the work God did in their marriage / their lives during the Love Like You Mean It cruise. We’re going to hear Part Two of a message from Gary Thomas today. He was giving us four ways that we can bless our spouse in a marriage relationship. Dennis: And what he’s going to cover today, Bob, is how we can truly love our spouse when they go through a difficult time. We have to have the attitude of a fireman; right? A fireman doesn’t resent it when there’s a fire; does he?—“Oh, man! I wanted to finish my meal!” or “I was playing Scrabble!” He goes out because that’s what he was trained to do—that’s why he’s given a paycheck / that’s why he’s there—to put out the fires. But in marriage, we think, “No, we’re there for the good times,”—we don’t want to have to put out the fires. But if we have the attitude of Proverbs 17, and we’re saying, whenever it arises, “I was born for this.” That’s what creates great connectedness with a couple because, when you meet your spouse in their weakness, and need, and hurt, they’re just naturally drawn to you. A friend of mine was a pastor up in Canada—a really young man—just one of the most gifted communicators I’ve ever known. Things were going so well; but he was in one of those really awful church fights that ended up in a church split and he was out of a job. It was one of those nasty ones, where there was a lot of gossip and slander, and people have to be blamed. People were saying awful things about him. He’s a good man with a good heart, but his reputation was just kind of wrecked. So he found himself in a job crawling under houses for $8/hour. He had this great vision that God was going to use him and bless his ministry. It was just humiliating that he could barely eke out a living. His wife was having to budget on one-third of what they were living on before. She could have gotten down on him; but she said: “Honey, I believe in you! I know God has a plan for you. This is a momentary reprieve.” She never lost her faith in him, even with people saying ugly things about him. She was there for him the entire time! Grant felt so humbled that—when she could have piled on and said, “You know, maybe what they’re saying is true,”—but she was there for him. She said, “I was born to get you through this.” They grew together. He grew as a believer. I was talking to one of his elders a decade ago. They were telling me: “You know, we know we’re going to lose him. He’s too gifted. He could be paid three times what we pay him / he would be in a city that’s larger, where people could grow. It’s hard to grow a church when you kind of push the boundaries of the population.” I know / I thought why Grant hadn’t taken up any of those offers because he was getting regular contacts. I called him just a year or two again, when I was working on A Life-long Love. I said: “Hey, Grant! Just between you and me—I won’t tell anybody—I just need to know, between you and me.” [Laughter] You see, Grant’s wife, Laurel—the one who protected him—has been going steadily blind until, now, she is almost completely blind in their small community of Linden, Washington, where she knows their house, she knows the community—everything is set up for her. These are tough things; but if you write them down and if you apply them, they work! They draw us together. They take a lot of courage. If you’re frustrated in a disconnected marriage, the solution isn’t to kill your marriage. That’s what Satan likes: “See how frustrated you are? See how distant you are? Here’s what you do—you kill your marriage / destroy your family.” What does Jesus say Satan comes to do in John 10? [Audience response] “Satan, the thief, comes to steal, to kill, and to destroy.” Whenever that’s the solution to your problem, you know who you’re listening to. Jesus told us that is his[Satan’s] motive, that’s his operation, that’s his solution. But Jesus says, “I have come that you might have life and you might have it abundantly.” God wants us to have life-giving marriages and abundant marriages. In His Word, He’s given us these four things, all out of Scripture, where we can reconnect—we can direct our hearts to have a more connected marriage. When we do, it becomes so powerful. I want to end with the story of a couple that did this later in life. How many of you have heard of Robertson McQuilkin? A good number of you have; but if you had heard me talking 15/20 years ago, it would be like this: “How many of you have heard of James Dobson?” [Response] Okay—that’s what I mean. He [Robertson] and his wife Muriel were the power couple. They were going to conferences / he was president of a seminary. Both were successful authors. They would speak at all of those things. As they were just entering their 40th year of marriage—not that old—his wife Muriel was diagnosed with early-onset Alzheimer’s. He wants to live with a blessing mentality—not “How can I get my needs met? Why do I have to put up with this?”—but “How can I bless her?” Well, he knew she loved art. She had never been to where some of her favorite masterpieces were kept. So he set up an appointment to go to London’s Tate Galleries, where a lot of her favorite masterpieces / the originals were kept. It broke his heart because the day they got there—it was already advanced enough that she had good days and bad days—and this was not a good day. She raced past some of these masterpieces like she was going through a Hallmark store. It broke his heart that part of his wife was already gone. There were the embarrassing moments to get there. During the flight, she had to get up—it was a long flight—and use the restroom. Robertson thought to himself, “Man, if she gets in there and she’s able to lock the door, she might not be able to unlock it and she’s going to panic.” So he gets up behind her and he follows her in. He said: “Look, I saw the smirks of the passengers around us and even the flight attendants. I knew what they were thinking: ‘You guys look a little old to be trying to join the mile-high club.’” [Laughter] You know what? He didn’t care what people thought—he cared about his wife’s welfare, he cared about his wife’s safety, he wanted to serve his wife. He said: “Let everybody laugh. I’m going to be connected to my wife.” So he took care of her. Then, when they were flying back to the States, he found that Muriel could get restless in an airport. The best thing to do was to just let her go around. If he tried to get her to stay seated, she could just get kind of fidgety. He’s a rather slight man. I’m sure it was comical because he had both of their bags, and his wife is just darting here and there and there. He would just follow her, and then he’d sit when she’d sit. That’s the power of a connected marriage. But it wasn’t just Muriel that loved Robertson / Robertson loved Muriel. Everything changed in his life when, one day, Muriel started to panic. Robertson was president of a seminary, and his house was on the campus there. His office was at a different building. Muriel only felt safe, at a certain point, when Robertson was near her. She couldn’t find him, so she ran out of the house and was running up and down the sidewalks, trying to find her husband until somebody saw her, knew who she was, and directed her into Robertson’s office. She showed up in his office with bloody feet—she’d been running on concrete. She forgot to put on her shoes—she just wanted to find her husband. Robertson looked at those bloody feet, and he knew what it meant. He knew his time as president of that seminary was done. That’s the key of a disconnected marriage—we can’t have a love affair with our spouse if we have a love affair with ourselves. If we’re going to say, “I’m not going to be honest because I want to do what I want to do and not lose his / or her approval,” or “I don’t want to bless you. I want to get my needs met,”—that’s a love affair with ourselves—or “I don’t want to kill this spider. I enjoy this! 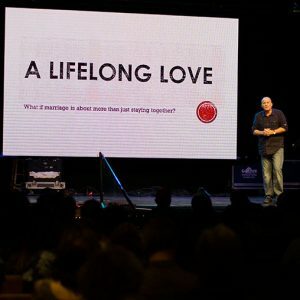 Why should I give it up?” or “I want to resent this and say, ‘I wasn’t born for this!’”—that’s a love affair with ourselves, and we can’t have a love affair with our spouse when we serve ourselves first. But when we do that—when we’re honest, when we bless our spouse, when we kill the spiders, when we say, “I was born for this,”—we create the witness that I was talking about last night from John, Chapter 13. That’s what happened with Robertson and his wife. When she was still able to walk, he would take her out for these walks. He liked for her to get some sun. They lived on a busy street. I’m sure it was kind of funny because here you have this slight man, who’s darting back and forth to stay on the outside of his wife, because he didn’t want her to dart into the street and get hit by a car. Even a man, who’s literally losing his mind, knows love when he sees it. That’s the power of a connected marriage. You don’t have to destroy your marriage if you feel disconnected. You might love being married if you can get reconnected, and I believe these things will help you do that. Bob: Well, a great word today from Gary Thomas—Part Two of a message that he shared onboard the Love Like You Mean It marriage cruise. Let me just encourage our listeners—if you missed any portion of Gary’s message, you can download these programs from FamilyLife Today. Just go to our website, FamilyLifeToday.com, to download. Let me also mention the new FamilyLife app that is available. If you go to the app store for your phone, whether it’s Android or iOS, and you type in FamilyLife—one word—all one word / FamilyLife—the FamilyLife app will be right there. Download it. It’s free. It gives you quick, easy access to everything we make available, here at FamilyLife. Dennis: Yes; and it’s really a good app, Bob. I want to encourage our listeners to get it because it will make FamilyLife Today available to you regardless of where you are. You can just listen to it on your smartphone or your iPad®—it really is a great resource. What Gary has reminded us of, here on the broadcast today, is Galatians, Chapter 6, verse 9—it says, “And let us not grow weary of doing good for in due season we will reap if we do not give up.” What Gary’s talking about is—even if your spouse is going through what has become seasons / not just a brief period of suffering, but going through something on an ongoing basis—you’re thinking, “How do I keep doing good here?” the Scripture says, “Let us not lose heart in well-doing for in due time”—there is a God who sees. He may not reward you in the way you think He ought to reward you, but you will be reaping blessings as a result. Keep on loving your spouse regardless of what they’re going through. Bob: Gary has written a book called A Life-long Love, where he explores what it is that causes marriages to drift toward isolation rather than the daily choices we can make in a marriage to grow closer together. We’ve got copies of that book in our FamilyLife Today Resource Center. 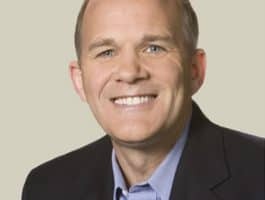 If you’re interested in a copy of Gary’s book, or if you’d like to listen to a conversation we had with Gary a while back on this subject, you can go to our website, FamilyLifeToday.com, and you can either listen to those past programs or you can order a copy of the book, A Lifelong Love. Of course, if you missed any of Gary’s message this week on FamilyLife Today, you can listen online. Again, the website is FamilyLifeToday.com. I also want to mention the new FamilyLife app. If you go to your app store, either for your iPhone or for your Android phone, look for FamilyLife—put it all in as one word. Our app should pop up at the top of the list. Download it for free. It gives you quick, easy access to FamilyLife Today radio programs, articles, resources—the things you’re looking for, available when you need them, and easy to find right on your smartphone or on your portable device. Again, go to the app store and look for FamilyLife—all one word—to download the new FamilyLife app. Then, be sure to make plans to join us on the Love Like You Mean It marriage cruise in 2017. Valentine’s week, we’ll leave from New Orleans on February 13th. We’ll travel through the western Caribbean. With us onboard will be Kevin DeYoung, Paul David Tripp, H.B. Charles, Jeremy Camp is going to along—David Phelps is going to be with us, and Michael, Jr. We’ve got a great lineup for the cruise, and we’re about half sold-out at this point. Tomorrow, we’re going to hear from Lysa TerKeurst, who was also with us on the Love Like You Mean It marriage cruise this year. She’s got some counsel for wives about what you can do to capture your husband’s heart. I hope you can tune in for that.